A book of the winner’s choice (up to $20) from The Book Depository (winner must live where The Book Depository ships!). Might I recommend a few of my recent favorites? Pandemonium, The Disenchantments, Wanderlove, A Million Suns, The Statistical Probability of Love at First Sight, The Scorpio Races, and Daughter of Smoke and Bone, but, of course, if you win, you choose! 1. For one entry, leave a comment telling me about a 2012 release you’ve read and loved OR name a book that’s coming out in 2012 that you’re dying to read. 2. The giveaway closes one week from today, Saturday, April 14th, at midnight, PST. (I will post the winner’s name on Monday, April 16th). 3. Once the two winners’ names are posted, the first to email me will have first choice of the prize they prefer (The Fault in our Stars OR The Book Depository book). The second winner to email will receive the remaining prize. 4. Want to earn additional entries? *Please tally up your entries and include the total in your original comment! Yay! I love giveaways, even my own. Good luck! I LOVE THIS BOOK!!! Pick me! Pick me! *ahem* Thanks for the giveaway, Katy. 🙂 Oh, and two releases I’m most looking forward to: Insurgent and Nevermore. I’m an old (young at heart) subscriber, I’m a tweet peep, and I tweeted about the giveaway. +6 for me. Thanks again, Katy! G for Giveaway is a great idea! Hmmm…I love Hallowed by Cynthia Hand. Don’t worry about putting me in the contest…but good luck to those who enter! Yay! I love giveaways! 🙂 Hmm, there are so many books coming out in 2012 that I’d love to read, but the one that’s sticking out right now to me is I Hunt Killers by Barry Lyga. One of my favourite 2012 releases was CINDER by Marissa Meyer. Such a fun new twist on the Cinderella fairy tale! +1 following you on Twitter. Well, you know I’m waiting for FLAWED more than anything. But I just finished Hannah M’s Gone, Gone, Gone and I squishy loved it! Fantastic!!! I’ve been looking forward to this book. I read and loved Wanderlove by Kirsten Hubbard. I cannot wait for Blackout by Mira Grant. Oooh g for Giveaway. Cool. I’m dying to read Bitterblue by Kristin Cashore. Like really dying – is it out yet? I’ve read TFIOS and it was amazing. New follower here and Twitter. I recently read Out of Sight, Out of Time by Ally Carter. So far, that is my favorite 2012 release. I’m most looking forward to In Honor by Jessi Kirby. I LOVED Wanderlove, and I’m really looking forward to Insurgent! I’m an old follower here and on Twitter, so four points total for me. Thanks! Like many, I’m definitely looking forward to Insurgent (and it comes out on my B’day – so what a great birthday read for me!). Would love to check out Wanderlove, too! Great G post, Katy – thanks for the Giveaway! Thanks so much for this giveaway! I’d love to enter! I loved Cinder by Marissa Meyer, which was released in January. And The Fault in Our Stars by John Green was absolutely beautiful (I’d love to actually own it). I also really loved the new Gallagher Girls book, Out of Sight, Out of Time, which was released last month. I’m really looking forward to reading This is Not a Test by Courtney Summers, which will be out later this year. I read INCARNATE and loved loved loved it! Woo, books! Yeah, I also have weird luck with giveaways, so hopefully it will work this time around. I loved TFiOS, and I’m looking forward to reading Insurgent and A Million Suns. The 2012 release I’ve read and loved was The Dark and Hollow Places by Carrie Ryan,I got so addicted to this series I just couldn’t stop reading!Too bad this was the last book,I really think she should write more book to this wonderful series! Such an awesome giveaway! So far the best book I’ve read in 2012 is TFIOS. So I’m entering the giveaway, but if I end up winning the book vs. the Book Depository prize, I’ll pass so someone else can win it. I loved Grave Mercy. Most looking forward to Bitterblue! I’m really looking forward to Tangle of Need by Nalini Singh. Only a month and a half to go! I’m dying to read AMELIA ANNE IS DEAD AND GONE (how fitting) but I have to wait until July!? Thanks for the giveaway and thanks for all your terrific blog posts! Eeeep! I want to hug you right now! Thank you so much for the giveaway! 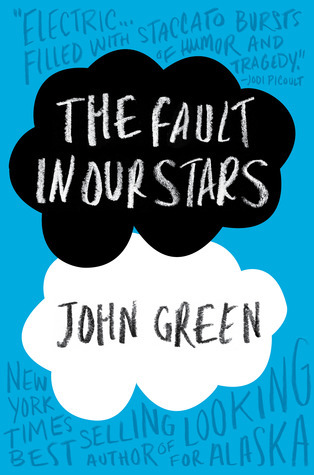 The Fault in Our Stars is in fact my absolute favorite read this year.